Company: Mori Building Co., Ltd.
About Mori Building Co., Ltd.
Mori Building is one of the leading property developers in Japan, with consolidated annual sales of US$1.4 billion in 2004. Mori Building owns 127 buildings and many of them are located in the center of Tokyo. The Roppongi Hills Mori Tower (Mori Tower) is a well known ultramodern skyscraper that was built in 2003. It has a total floor area of 380,000 square meters on fifty four aboveground levels and six underground levels. The building houses offices, restaurants, shops, and a museum, etc. 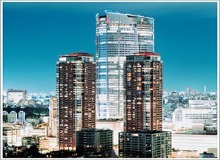 Major property developers such as Mori Building are obliged by the Japanese government to reduce energy consumption and report actual results each year. For this reason, Mori Building chose to construct a control system for the Mori Tower which enabled the unified management of data from widely distributed locations throughout the structure. To gather this data, Mori Building selected Exaquantum, Yokogawa's information management system. Exaquantum has an Excel add-in function that simplifies the task of exporting current and historical process data to an MS-Excel spreadsheet and makes it possible for users to customize their data viewing windows. Exaquantum does not require the design of a detailed database structure: users only need to define tag names. Once Exaquantum is installed, the corresponding data are automatically stored in Exaquantum and the user can collect and manage the data easily. Since the Mori Tower had already adopted OPC (OLE for Process Control) for its central monitoring system, Exaquantum was able to connect with existing OPC servers without any special modifications. In other words, there was no need to develop a new interface driver. In an Exaquantum window, operators can monitor the amount of energy consumed to produce warm and chilled water, which is shown in relation to total energy consumption on a primary energy basis. Data exported to MS-Excel can be displayed in an easily understood pie chart or bar graph, simplifying the analysis of data. 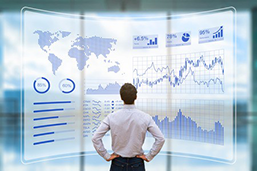 Based on the current and historical data, the user can analyze actual performance and establish targets for energy efficiency and cost effectiveness. The intake volume of outside air can be adjusted seasonally to reduce energy consumption. This is done in the winter by increasing the intake volume to minimize the consumption of chilled water by the air conditioning system, and in the summer by decreasing the intake volume to reduce the load on the air conditioning system and maintain desired carbon dioxide levels. With Exaquantum, the energy savings achieved through these adjustments in the outside air intake volume can be monitored in a window. The efficiency of the chilled water transportation system is indicated by the Water Transportation Factor (WTF). The WTF is calculated by dividing transported calories by the electric power consumption (KWh) of a chilled water pump. If the WTF is higher than 35, the pump is considered to be operating efficiently. The figure plots WTF data from April 2004 to August 2004. Most dots are below the WTF=35 line, where the WTF value is higher than 35. This chilled water transportation system can be considered to be operating within the WTF standard. The data needed to calculate WTF can be dragged and dropped into an Excel spreadsheet using Exaquantum's Excel add-in function. Mori Building's operators are most satisfied with having unified access to widely distributed data and with the data management system's ease of use. They are also pleased with the ease with which Exaquantum can be connected with existing systems and with its support of OPC.